Back in 1998 Signature Natural Rugs pioneered the use of natural fibres in stylish & hardwearing floor coverings & have never looked back. Our mission is to offer you the opportunity to design, create & order your own bespoke natural rug, online. Using only the finest natural materials sourced from all over the world, which are then meticulously hand crafted here in the UK. We are a constantly developing company with over 15 years experience making & supplying the finest natural rugs. Our online store enables you to design your own unique natural rug in the (Natural Rug Builder) which also allows you to order next day complementary natural fibre samples. Known for our innovative natural rugs, we make it a priority to remain at the forefront of creative design. Our dedicated team of designers & crafts people are always experimenting with new materials, interesting textures & beautiful patterns to help fuel your imagination & breathe new life into your home. 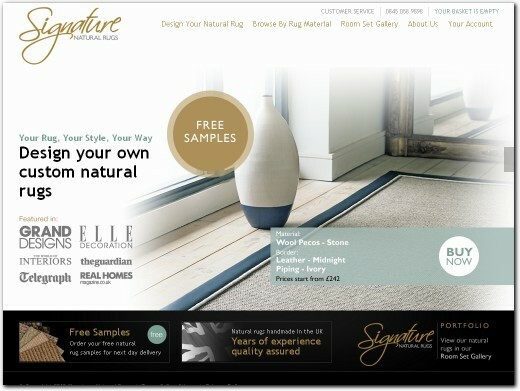 As well as supplying thousands of retail customers in the UK, Signature Natural Rugs also work closely with Interior designers & have supplied some of the finest natural rugs to many of the most prestigious hotels & residential homes around the world. The team at Signature Natural Rugs are all dedicated to supplying beautiful, handcrafted natural rugs from order to delivery. For further help or information on our natural products please don't hesitate to contact our sales department & speak to one of our natural rug specialists. UK (Mayfair, London) based company - established in 1998 - providing rugs and carpets for sale. Website includes e-commerce facilities, delivery and returns information (within terms and conditions), full company contact details.